India beat New Zealand by 6 runs in a low-scoring thriller in Thiruvananthapuram after the match was reduced to eight overs each. India and New Zealand went right down to the wire in the T20 decider – just like they did in the ODIs prior to it. India had come out on top by 6 runs in a high scoring contest in Kanpur and the third T20 proved to be a mirror image of it. This time around, the two teams played out a low scoring and equally close match. Credit for that, for the most part, goes to Yuzvendra Chahal and Jasprit Bumrah. In a rain-curtailed game, India were put in to bat first by Kane Williamson with the game reduced to eight overs a side and a damp surface to make do with things proving difficult for the batsmen. The hosts put together 67/5 in the allotted overs with Manish Pandey top scoring with 17 runs. In reply, New Zealand strived and saw big-hitter Colin de Grandhomme also score a quick fire 17 runs from 10 balls but didn’t get the support in the final two overs to seal the deal. Chahal’s run pinching effort to register figures of 2-0-8-0 and Bumrah’s two wickets proved decisive as India kept things tight. It also helped that India were equally impressive in the field. Rohit Sharma took a blinder to dismiss Colin Munro as he scrambled back and plucked his hand out to hold on – much to the adulation of skipper Virat Kohli. Kane Williamson and Tom Bruce’s wickets fell after impressive run outs with Hardik Pandya involved in both efforts. In the first, he hit the bullseye with one wicket to aim and in the second he threw perfectly at MS Dhoni to add to New Zealand’s troubles. In the first ever T20 played in Thiruvananthapuram and first international game in 29 years, the crowd saw India start off slowly as Trent Boult and Tim Southee, replacing Adam Milne, kept Rohit Sharma and Rohit Dhawan in check. In such shorts, with thin margins deciding things and little time to waste, Dhawan was forced into upping the ante – and failing. Rohit followed the next ball and India were under pressure. Kohli alleviated that somewhat with a four and a six to Ish Sodhi but he perished in the very same over. Pandey scored a four and a six before being caught on the boundary in the final over by a spectacular piece of work between Mitchell Santner and Grandhomme that involved flying take and pass in the air. 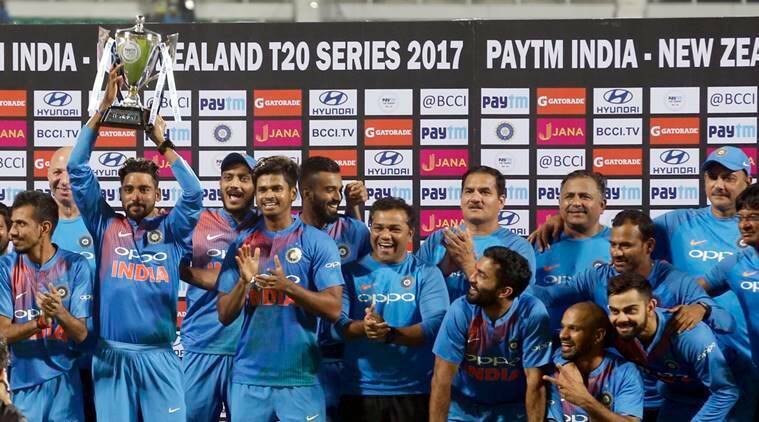 The win means India who came into the series having never beaten New Zealand in T20s add two to the tally and a series win as well. For New Zealand, a defeat means they lose out on a chance to go top of the T20 rankings and Pakistan remain at the helm.